D.L. 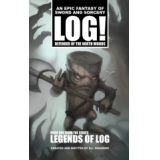 Suharski is an aspiring writer and cartoonist with his first book series, Legends of Log. During the dark ages of sword and sorcery, a wooden gargantuan walks and breaths to defend the forest of the North Woods. But after traveling with many questions, the giant log will now journey to the peaks of Hilltop and battle the evil fires of the warlock and the fire dragon. Only to be led on a path of firey destruction that hides within the reaches of the Dark Woods. AN ALL NEW EPIC TALE WITH AN ALL NEW EPIC HERO! Log returns back to the North Woods as he gets closer to finding out the answers he seeks.But that one step closer will lead him on a path of a firery destruction where he must battle the evil Warlock Darkgrim and his dark fire dragon. *Includes an afterword by the author about the book, character and upcoming works.